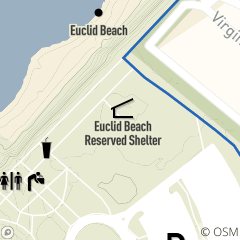 Euclid Beach Shelter is located off Lake Shore Boulevard in Euclid Creek Reservation in Cleveland. The shelter is near Euclid Beach. Flush and non-flush restrooms nearby. Reservable May - October, Saturdays and Sundays only. For reservations or more information, call 216.635.3304, Monday - Friday, 8:30 a.m. -- 4:30 p.m.